Are you searching for a beautiful and detailed black nursing bra? How about the Eclipse breastfeeding bra from Hotmilk? We think that you may really like the level of detailing and pretty touches this bra offers. Also, if you want good support from your nursing bra then this may be a good option too. So what makes this bra so luxurious? Well, it has a really nice diamante touch in the centre which is offset by a lovely bow beneath it. It is also trimmed with delicate lace – we think you will find it will make you feel really feminine. It is designed in a jet black fabric and we think it is our prettiest black breastfeeding bra. How about the structure of the Eclipse bra? It features a newly developed external side sling support which runs from the shoulder strap point to the under-bust. This will offer you a superior support and shape. Breastfeeding advisors suggest that you avoid underwired nursing bras during your breastfeeding months if possible, so you may be pleased to know that this bra is wirefree. Would you prefer an A-frame style nursing bra? Well this bra has an A-frame style which should give you discreet support at the top of your cup, even when you are breastfeeding your baby. If comfort is important to you, then we think you may like the fact that this bra has a 100% soft cotton lining. This means it will be delicate against your sensitive breasts during pregnancy and breastfeeding. What about the back? Well, this has an extended 6-position back fastening to help you get the perfect fit. This bra also features easy-to-use one handed nursing clips, which should mean that you can open the bra with one hand whilst holding your baby in your other arm. If you want a full set of nursing lingerie, then please see below for the matching French Knickers or Bikini, but please note, these must be bought separately. 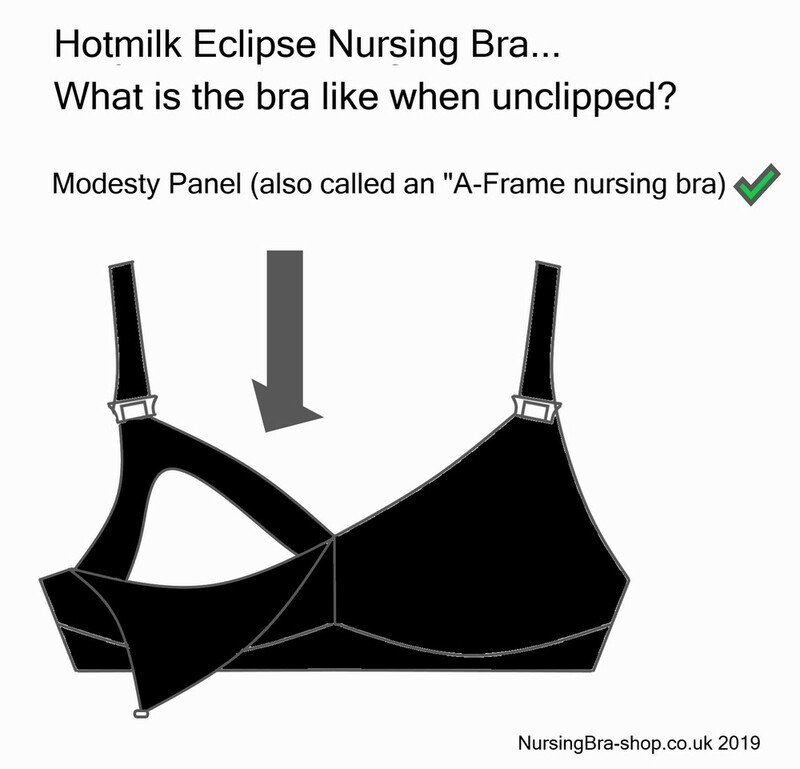 So why do we think you should choose the Hotmilk Eclipse nursing bra? Well, we think you will look and feel really feminine in this bra. It also should offer you good support and is ideal for both pregnancy and breastfeeding, helping you to get a longer life from the bra. Our prettiest black nursing bra and a lovely choice.